Electropolishing is a process that removes material from the surface of the part. The removal of outer layer material from the metallic work piece creates a shiny, mirror finish resembling the polish of bright chrome car parts. Because of the removal of material, deburring occurs on burrs up to .005″; even on the most complex of parts. No distortion of the part occurs because the process is non-mechanical. Material removal also results in reduced microfinish values of up to 50%. This can be critical for parts where metal contact is important. Since electropolishing removes impurities from the surface of the part, corrosion resistance is increased, acting as a form of passivation. We electropolish 300 series, nitronic 60, 17-4ph, duplex stainless steel parts. Depending on carbon content of the steel, we can run 400 series as well. 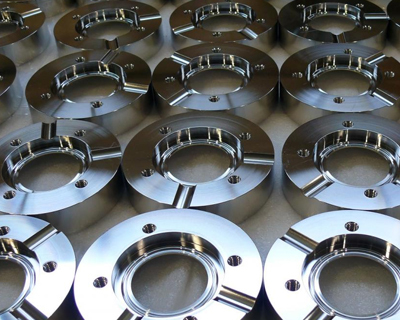 The cosmetic appearance is substantially enhanced when the 300 series part is electropolished versus a 400 series part. This is because the chromium and nickel within the alloy are greater in the 300 series. The increased levels of chromium and nickel give the part a shimmering finish when the surface impurities are removed. 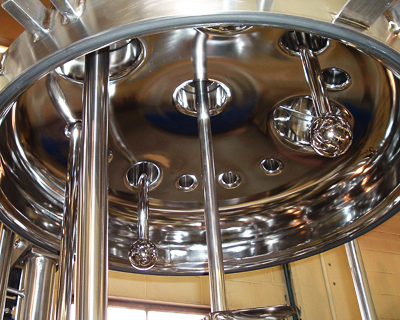 Our electropolishing processes conform to ASTM B912 specifications. 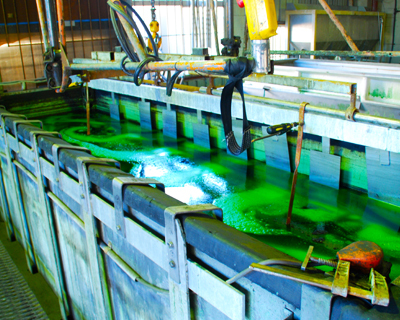 The electropolishing process is essentially electroplating in reverse. A power source is required to convert the high voltage AC current from the power grid to low voltage DC current. The negative terminal of the power supply is then connected to a stainless steel cathode plate, which is lowered into a chemical bath. This bath contains a temperature controlled electrolyte. 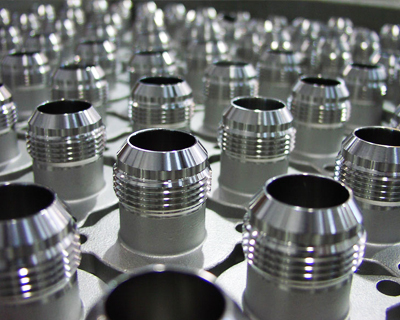 Maintaining a certain temperature range during the process is important to reach the desired finish. The parts are then placed on a titanium rack that is connected to the positive terminal of the power supply and dipped into the bath. The electrolyte acts as a conductor between the negatively charged cathode plate and the positively charged parts creating an electrical current. The metal atoms on the surface of the part are ionized and drawn into the electrolyte, creating a solution. Ionization of the metal occurs faster at the edges and on burrs, just as lightning is attracted to tall trees and buildings. What this means is that threads can be rounded, sharp edges or burrs will be minimized, and holes can be enlarged. When the part is removed from the bath, clinging electrolytes must be removed in a rinse and then dried.